A strategy I found to get the first two levels of files of an SVN repository. I guess it could also be used to go deeper if you use this version and run it more then once? As it happens, I often have to do estimates for small to kind of large projects. As most developers will know, estimating is not as easy as you think. It is even harder to guess-timate something you have never done before. During my project management classes, I did learn about three point estimation, a pretty useful tool which can help anyone get a more balanced estimate of how long the task or activity is likely to take. As for all estimations, we need to first break down the project into individual tasks or activities. Once that is done, we need to decide on the time it will take to complete each task. However, rather than using a ballpark estimate, we can use three point estimating to get a more accurate idea. To do a three point estimation for a particular task or activity we need to get three different numbers: the most optimistic estimate, the most pessimistic estimate and the most likely estimate. Once we have these numbers, its possible to calculate the real value based on the three point formula. Start by adding your optimistic time to your your pessismistic time and then add four times the most likely time. Take the total and divide it by six. This will give us a result which is more likely to tell us exactly how long completing the task or activity is going to take. To fix the problem I had to manually configure the proper path to the magic file on the server. This manual page documents the format of the magic file as used by the file(1) command, version 4.17. The file command identifies the type of a file using, among other tests, a test for whether the file begins with a certain magic number. The file /usr/share/file/magic specifies what magic numbers are to be tested for, what message to print if a particular magic number is found, and additional information to extract from the file. 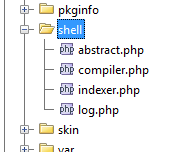 Then I added a new configuration entry to the Mantis configuration file: config_inc.php. This file is located at the root of the Mantis folder and can be edited by any text editors such as nano, pico or vi.